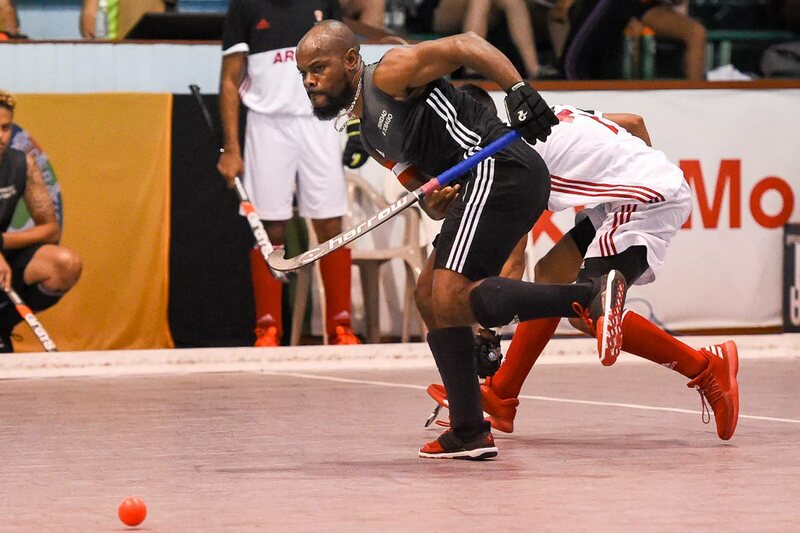 Trinidad and Tobago captain Solomon Eccles makes a pass during a Pan Am Indoor Hockey match against Canada yesterday at the Cliff Anderson Sports Hall, Georgetown, Guyana. Trinidad and Tobago men’s hockey team moved a step closer towards qualifying for the 2018 Indoor Hockey World Cup in Berlin, Germany, when they secured a spot in today’s final of the 2017 Indoor Pan American Hockey Cup at the Cliff Anderson Sports Hall, Georgetown, Guyana. The TT men’s team finished the six-team round-robin phase with a 100-percent record after a pulsating 7-5 triumph over Canada yesterday. The Canadians seemed to have the game wrapped up as they strolled to a 4-0 lead, courtesy a double from Jonathan Roberts (14th and 19th minutes) and one apiece from Micah Teixeira (second) and Lyle Fernandes (22nd). But Trinidad and Tobago staged a fantastic fight-back, with five goals in the space of four minutes. Jordan Reynos reduced the deficit to 4-1 in the 27th while Marcus James netted twice, also in the 27th, to trim Canada’s lead to 4-3. Solomon Eccles levelled the scores at 4-4 in the 29th while Jordan Vieira put TT ahead in the 31st. Devohn Noronha Teixeira equalised for the Canadians in the 34th but TT regained the lead once again through Mickell Pierre in the 38th. And Akim Toussaint ensured a fifth straight win for the TT outfit, in the 39th. Trinidad and Tobago will tackle Argentina in today’s final at 7 pm, with only the winners guaranteed a place at the Indoor Hockey World Cup. Also on today’s final day, Barbados and Mexico will meet at 1.20 pm in the fifth-place match while Canada and Guyana will battle for the bronze medal, at 4.10 pm. The Trinidad and Tobago women’s squad ended their disappointing round-robin campaign yesterday with a come-from-behind 11-4 hammering of Barbados. Krizia Layne, Brittney Hingh and Arielle Williams each netted twice for TT, who won their second successive game, after losing their first four. Ayanna Wilson put the Bajans in front in the second minute but TT responded in convincing fashion, with strikes from Kristin Thompson (fourth), Layne (ninth and 18th), Savannah de Freitas (11th), Hingh (12th), Zene Henry (14th) and Williams (20th). Hingh got her second goal in the 23rd to put TT 8-1 up, but Barbados rallied with three goals from Cher King (24th), Tammisha Small (28th) and Katrina Downes (28th). Williams netted Trinidad and Tobago’s ninth goal in the 30th while Shaniah de Freitas (34th) and Blair Wynne (37th) ended the rout for the twin-island republic. The national women team will complete their stint today, from 11.55 am, when they battle for fifth place overall, against the winners of last evening’s seventh-place match between Guyana and Barbados. Canada will face Uruguay in the third-place playoff from 2.45 pm while the final, between the United States and Argentina, is set to begin at 5.35 pm. Reply to "TT win thriller to reach Indoor Pan Am final"